Set of 3 includes Power Recline, LED and Top Grain Leather Match. Available in Black or Brown. The VEGA Broadway is the newest space saving design from VEGA that offers a number of exciting features like lighted cup holders and base rail on motorized versions, a chaise style foot rest on both manual and power versions. Of course, this model has our unique powered grommet hole in the front arm of the seat which is a connection that accommodates a whole range of accessories. 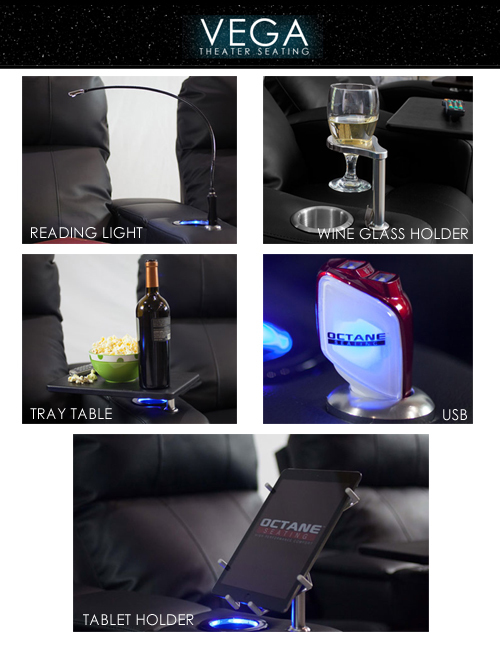 These accessories include tray tables, USB chargers, reading lights, wine-glass holders and iPad holders to mention a few. The VEGA Broadway theater seat is made with hardwoods and a combination of engineered wood combined together to deliver a frame that is rock solid and ready for everyday use. Interior seat cushions use pocket coils - small springs similar to that found in a mattress - to give the seat cushion the ultimate ride. The coils are wrapped and grouped and will ensure the seat does not sag over time. The seat back are high on this model for excellent neck and back support and contain blown fiber that is resilient and comfortable. Leather Match. Power Recline. Select between straight and curved rows.